At 11am we reach the border. Joe the Brit and his brother have felt awful the entire fifteen hour journey from Siem Reap; the one poor chap puking at every stop along the way. His girlfriend and I eat oranges and chat about London. The officials at the border crossing are less welcoming than a bout of food poisoning. Having crossed that imaginary geographical line, however, the buildings are now different and homes have changed and the language on the billboards is no longer Khmer; I am ecstatic to be somewhere new again. Not just a new city, but a new country, with different people, a strange language and weird food, unfamiliar currency and diverse scams and who knows what else! I step off the bus in Ho Chi Minh City and am greeted by the usual flock of men hounding passengers to hire their tuk-tuk. Today I’m feeling like a cheapskate, so I huff around town with my luggage in search of the cheapest dorm possible. But nothing has the right ‘feeling’. I find a group of Czech’s who point me to a street that is free of any sort of accommodation. Sweaty and exhausted, I collapse on a mini lawn chair on the sidewalk where a little family sits next to their drink cart. I look at the array of beverages. The lady hands me what must be a Vietnamese cola and it’s the best thing I’ve ever tasted. A big woman on my left talks at me incessantly in Vietnamese. The language barrier is broken a few times with hand gestures, and when I answer her that no, I do not have a baby, she uses two fingers to suggest that I get together with the guy sitting behind her. My head shakes. I put my two hands together and rest my head on it in the international sign for ‘sleeping’. Where can I find a hostel? She waves down the street and tells me to come back tomorrow before walking off. Not a hundred feet away, there is a dorm room for five bucks a night, the cheapest I’ve found all day. Thanks, lady. Sweat has collected in my bra and the bed in the air-conditioned dorm room looks REAL comfy, but I’m in a new country! The draw to explore is stronger than those cool, crisp sheets. 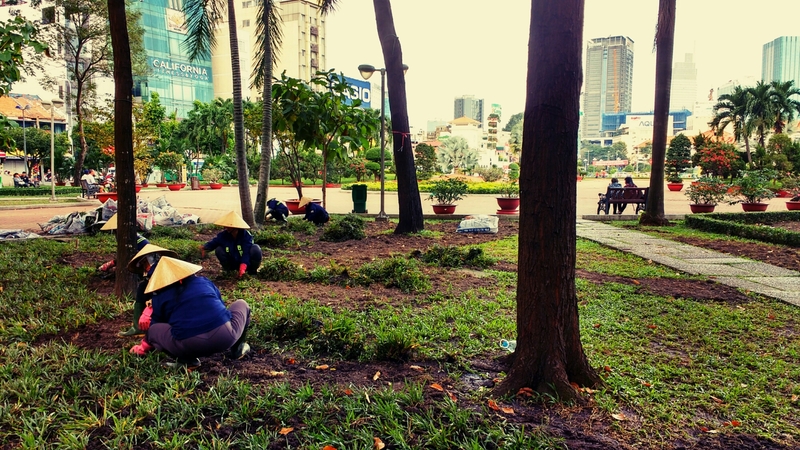 I ditch the damn pack and dive into the masses of Saigon. What a city! It is Bangkok with Vietnamese subtitles. It is pho fo’ days in lieu of pad thai. It is New Yorkian skyscrapers decorated with lights from Las Vegas Christmas, circa 2000. The street vendors have more sass than your grandma on her 90th birthday and half the wrinkles. It’s not Thailand, and it’s not Cambodia. The people are more salt of the earth types and the kids aren’t as cute. Lotus seed and ginger are the only sugar-coated things around here, and the ladies and gents don’t throw smiles around like candy. The Vietnamese are a little harder. 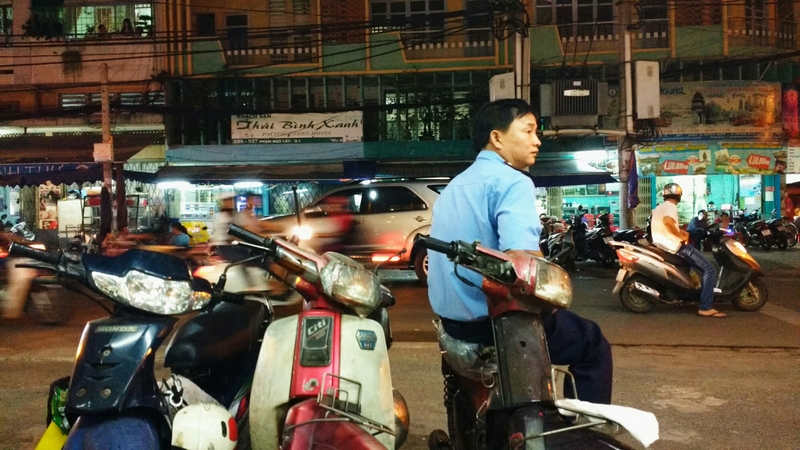 As usual, the traffic lacks rules, but these streets are wilder than those of Vietnam’s neighbours. Welcome to the East of the Southeast. If the earth was flat, then this is the exact spot the sun would be resting it’s flames for the night. Alas, ’tis round, and the sun only passes out of sight and exchanges it’s pastel skies for the moon’s dark, spotted one. Feeding time. My stomach is pulled in many directions by the strange food choices, but I settle for an ostrich kebab, and sit in a miniscule red chair at one of the tables on the sidewalk. My phone bleeps. It’s a message from Flo. He’s in the Con Dau Islands off the southern coast of Vietnam, and will be in Ho Chi Minh City in a few days. His plan is to buy a motorbike when he arrives, and explore the country on two wheels. Would I like to join him? I get some funny looks from my little red chair as I flail like a seagull in a bread factory. The excited giggling does nothing to help the spectacle. A road trip through Vietnam? On a motorcycle? I’ve dreamt about doing a motorcycle trip since I watched Mad Max with my family when I was young enough for it to give me nightmares. But the motorcycles were so cool, man. Motorcycles are badass. On top of that, I’d be gearing up on a new exploit with Flo, the witty German who climbed on top of a cave with me. It doesn’t matter that I only have a week and a half to spend in Vietnam. It doesn’t even matter that I haven’t a clue in the cosmos how to ride a motorbike. It doesn’t matter, because Flo will be here in a matter of days, and we are going to buy our very own MOTORBIKES! Later, I lay my head on the crisp bedsheets of my cool dorm and dream of leather and oil changes and Dennis Hopper.